After an outstanding start to season 2 of Batman: The Telltale Series, we are given The Pact this time around. While this episode packs a ton of attempted fan service, The Pact ultimately falls flat by telling a story that is only half-way interesting and ends up being slightly predictable. Granted, some of the choices that players will have to make during this episode were very difficult to make, but it’s clear to see that given the trajectory of this story arc, these decisions end up feeling inconsequential in the greater scheme of things. It seems that Telltale are more focused on moving the story forward rather than making this one episode as good as it should have been following a fantastic start. The Pact picks up right where episode 1 left off, with Amanda Waller revealing she knows that Batman is in fact Bruce Wayne. Batman realizes this means he has to play ball with Waller, at least to a certain degree, so he agrees to help her track down the rest of the members of Riddler’s gang, both as Batman and as Bruce Wayne. Luckily for players, John Doe, who is still not quite the Joker, is our ticket to this inner circle, which goes by the name the Pact and serve as the titular group for this episode. This second part of this five-episode series plays out with Bruce attempting to infiltrate the gang in order to find out exactly what they are up to after a string of dangerous heists for technology and weapons. The majority of the episode thus has players doing some slightly questionable things in order to gain rapport with the Pact. While these actions may not fall in line with Bruce/Batman’s personal code, these are necessary acts to serve the bigger purpose of shutting down this dangerous group. By the time I finally reached the end of the episode, I was blown away by how the end played out. Due in part to a surprise return from Catwoman, and also just generally wondering where the story would go from here made for an interesting conclusion, but ultimately, I felt like this episode should have been approached in a different manner so as to feel like a more worthwhile experience. This episode does introduce us to this universe’s versions of three classic members of Batman’s rogues gallery with Bane, Mr. Freeze, and Harley Quinn who are mostly welcome additions. Bane was a nice mix of his classic comic self, Venom injections and all, and his appearance in The Dark Knight Rises. The fight against him as Batman (which is also the only time you play as “the Batman” in The Pact) in the beginning of the episode was visually stunning, and one of the more memorable fights from the series thus far. Mr. Freeze was decent enough for the very limited amount of screen time he was given, but I suspect he will be given a more larger role as the rest of the season plays out. On the other hand, I’m pretty torn on this version of Harley Quinn. She looks great, albeit not too different from other iterations of the character. My biggest issue with her is that I am not a fan of her voice actress. She truly sounds like a mediocre attempt at recreating Arleen Sorkin’s Batman: The Animated Series Harley, like an amateur voice impressionist on YouTube. 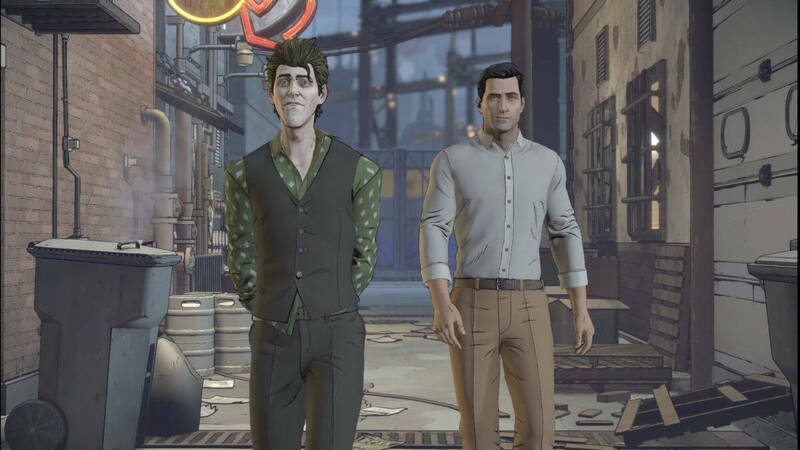 Furthermore, I’m genuinely confused by Telltale’s portrayal of the character in relation to John Doe, a.k.a. the Not-Quite-Yet Joker. When John introduces players to Harley, he had previously mentioned he was in love, and begged Bruce to attempt to make him look good to her. 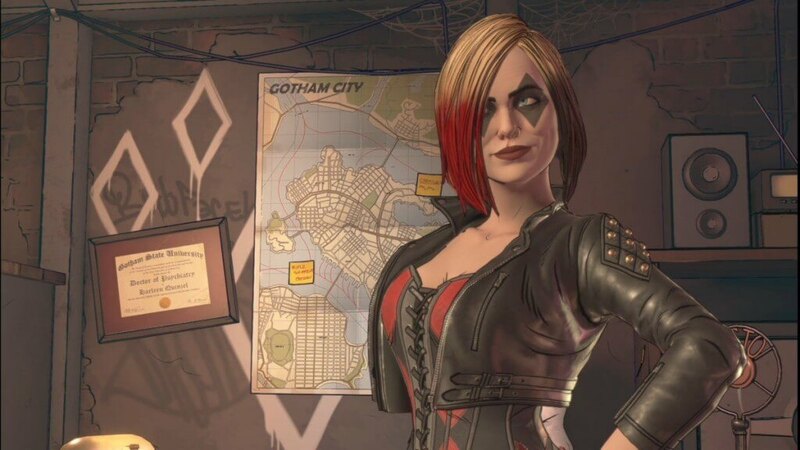 Harley Quinn is more like Joker than John Doe here, and John is more like Harley than her Telltale version is. John is doing anything he can to gain the attention and affection of her, even running to a bodega to grab her a slushie at her command. While none of this is bad, per se, it’s a strange dynamic to see reversed here with such an iconic villain as Joker. Hopefully, it pays off when John goes full-on Joker. While The Pact was not a bad episode, it at times felt unnecessary and flat-out predictable. By the time something interesting and surprising came along, I had already lost interest in the episode’s story. With Telltale’s track record of writing great storylines, particularly with the Batman license, this episode came as a disappointment. Hopefully the third episode improves on this one so we can get back to what made Batman: The Telltale Series such a success. Failing to deliver the same punch as the first episode, The Pact ends up feeling like filler, albeit with the promise of better stories to come.